Based on the book, 33 Days to Merciful Love, by Fr. Michael Gaitley, MIC, this 33 Days to Merciful Love Retreat Companion goes even deeper than the book alone and explores new material on the heart of St. Thérèse of Lisieux’s Little Way, uncovering the power of trust in the face of personal darkness, inspiring participants to become great saints amid ordinary circumstances, and laying the foundation for a personal consecration to Divine Mercy. 33 Days to Merciful Love Retreat Companion is a six-week retreat and falls within Stage Three* of the Hearts Afire Program. 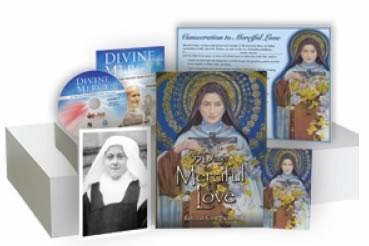 *Groups can decide to go through the 33 Days to Merciful Love Retreat Companion and the Divine Mercy in the Second Greatest Story series without going through Stages One and Two of the Hearts Afire Program. NOTE: If you would like to buy the book please CLICK HERE.